This tea cake from Yi Bang Cha Ma Si tea factory features the painting of the Beijing's National Olympic Stadium (the "Bird's Nest") and people from around the world standing in front of it. 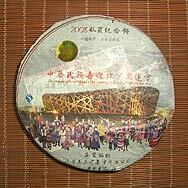 It is a collector tea cake produced as a memorial to the Beijing 2008 Olympic Games. 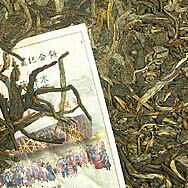 It was compressed using Pu'er tea leaves picked from arbor tea trees from around the Meng Song area in Yunnan province. The tea looks older than its age. 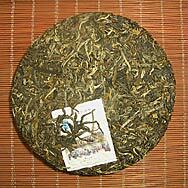 The first infusion also looks and tastes older than its age. The second infusion is stronger and probably reflects the true taste of the tea. The infusion is golden in colour, fairly bitter with sweet ater-taste. The aroma is mildly smokey and nutty.